Travel Round The World With Couchsurfing! Friends, the present is an era of internet and social media.Every time when millions of people search on the Internet. Social media has been somewhat of a rash on the internet nowadays. It is one of the top reasons of using internet. Today, most internet users are addicted to various social networking sites such as Facebook, Twitter, LinkedIn, Pinterest, Google Plus etc. Not only that, today every website is also available in the form of a mobile application, mobile internet access to everyone in recent years is the major cause behind compelling all the social media company to focus heavily on developing the best mobile applications. Today, the world’s most popular mobile messaging application is WhatsApp, I think so. Now I have to focus on travel-related materials, so today I’ll tell you about a website, which is a boon for nomads, calledCouchSurfing (couchsurfing.com). CouchSurfing is also a type of networking site, but also across something different. It is mainly designed for travel enthusiasts, but used mainly by high-quality nomads. It just is not very popular in India, but in the West it has earned a significant name. The website with the help of members of the interplay between host stroller (Hosts) are exchanged. If you create an account for this website, in any corner of the world you can find a host of other member. Suppose you go somewhere, you can find in that city any Couchsurfing member, can connect with the information, and if he likes it, he can allow you to stay with him. Thus a in new place, to stay with local people also feels warm and comfortable too, as well as the money can be saved by avoiding stay in expensive hotels! The website which was launched in 2004, today more than two million of the world’s cities over ten million members are registered. 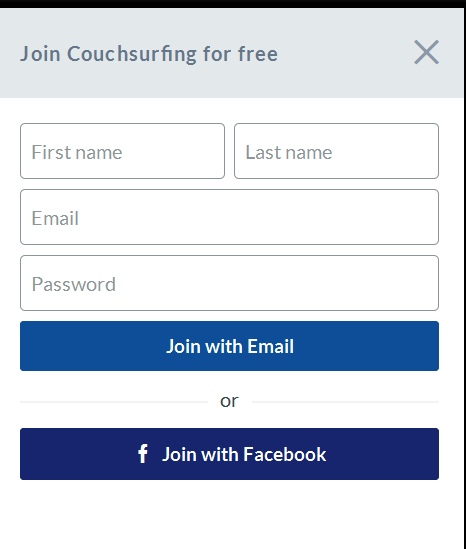 HOW TO USE COUCHSURFING?CREATE ACCOUNT(1) Go to www.couchsurfing.com. Createaccount. You can use Facebook ID or email id. The website also offers Android app, which you download from the Play Store or you can go to this link Click Here. (2) to complete your profile, as you will fill out the information, your profile will be completed and will grow as a percentage. Note that any other member write you a reference, it also increases the percentage of profile completion. You can also be a Paid Member, which is not compulsory, but it will boost your credibility, you will get hosts and surfers more easily. The annual fee is only 1,300 Rupees. Upon becoming a paid member, a green tick on your profile will be added. (3) Note that you can display on your profile if you want to host or not. You have four options Accepting Guests, May be Accepting Guests, Not Accepting Guests or Just Want to Meet Up. (4) Now you go into the search box at the top of the site, type the name of any place and host, member, group, etc. The search begins. (5) Suppose you found someone, then go to his or her full profile either add friend, or send a personal message, or directly request to stay. You can also write to theReference. (7) In addition to finding hosts and guests in this website, you will also find a variety of Groups and Discussions which you can join. You can also create an event, or may be involved. Overall it is a clean website, which is very easy to use. After all, no more than five-six thousand users in India, it is quite prevalent in the developed countries. Strangers to interact, to meet people of different cultures- all are very interesting, but in the minds of new users, doubt about couchsurfing is still maintained. So that’s why I advise you to properly check a partner before you hang out!.